Not to be confused with Gaultier (disambiguation). In 1933, when the NSDAP took power and established the state of Nazi Germany, Gauleiter became the second highest Nazi paramilitary rank, just below the new rank of Reichsleiter (National Leader). The Gauleiter now became the heads of the Gauleitung — the system of Nazi political regions set up to mirror the German states. 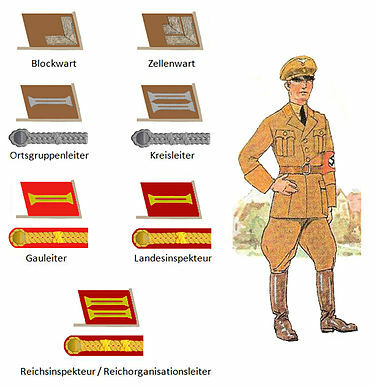 Also at that time Gauleiter adopted the two-leaf collar insignia most often historically associated[by whom?] with the rank. Within each Gau were a number of Kreise (districts or counties, singular: Kreis in German), followed by the Ort (municipal) level, which was the lowest in the Nazi Party organization. There were also two additional lower local levels (Block and Zelle), describing Party Cells and local Neighborhood Blocks. By this point,[when?] all political leaders wore official uniforms, with piping and collar-tab background colors indicating the level of the Party (Local, County, Regional, or National) that a Political Leader served. Wikimedia Commons has media related to Gauleiter.